Simple, nourishing apple crisp that is healthy enough for breakfast! Made with fresh apples, whole grains, healthy fats, and just a touch of sweetener. No weird ingredients, with gluten-free, dairy-free, and vegan variations! The first time I tried to save money by buying apples in bulk was almost a fail. Maybe the better word is sabotage. I purchased a giant box from the Farmer’s Market, parked it on the kitchen floor, and left the room. Turns out my toddler loved fresh apples as much as I do. But only the first bite. When I returned a few minutes later, I was horrified. Apples dotted the dining room floor. They parked beside chair legs where they had stopped rolling after he took one bite and dropped it, chubby fingers grasping the next unbroken apple. I handled it with all the grace you can imagine from a young mom strapped for cash and obsessed with food waste. Thankfully, applesauce and apple crisp are the perfect end to a bushel of apples – regardless of whether they were pillaged by a toddler or sat in the kitchen waiting for destiny. That year I began experimenting with the sugar levels in our apple crisp. Because inevitably, whenever a big pan of apple crisp was whisked out of the oven at my house, crisp became the food of choice for nearly every meal. Breakfast? Apple crisp with vanilla yogurt. Snack? Apple crisp – I’ll just take one bite or twelve. Dinner? Maybe we should eat some protein. More yogurt? Dessert? Finally – Apple crisp with ice cream. This is what we were really waiting for. I wholeheartedly embrace this practice, especially after discovering that apple crisp hardly needs any processed sugar to satisfy that fruity crisp craving. Extremely Flexible – want it to taste more like apple pie? Use more sweetener! Out of flour? Grind some oats in the blender and use that. If you like to watch a recipe made before trying it, I demonstrated how to mix up this crisp in this video. And in this version, we used pears – because it’s that flexible! For 10 years, I sliced apples the normal way. So I will never tell you that you need anything other than a knife and a cutting board. However, last year, I found this apple peeler/slicer/corer. I found mine at Aldi, but here is something similar. We buy bushels of apples every fall, and I always end up processing them somehow. We make apple crisp, apple butter, or applesauce. In order to save time and let my kids safely help me, I decided to try this contraption. GAME CHANGER. What took me an hour before now takes 10 minutes. Actually, it takes my kids 10 minutes, because this guy is so fun to use they want to do it. My favorite part is that you can choose whether it peels the apples or simply slices and cores them. People say that a lot of the apple’s nutrition is in or just below the skin. So for apple crisp, I leave the peels on. If you buy or process lots of apples, I highly recommend a tool like this. 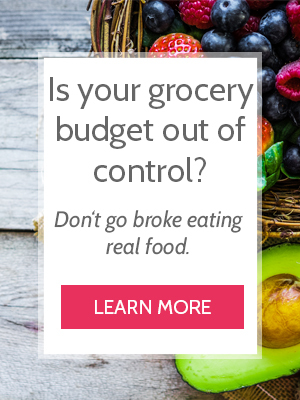 It will save you time, which means you can eat real food without spending all day in the kitchen and you are less likely to let those apples go to waste. If you try this recipe, let us know! Leave a comment, rate it, and tag a photo #cheapskatecook and @cheapskatecook on Instagram. Cheers, friends! Wash and slice the apples, leaving the skins intact. Place them in a 9x13-inch pan and toss with lemon juice, cinnamon, and honey (if using). In a small bowl, combine oats, flour, sugar, and cinnamon. Evenly sprinkle the topping over the apples in the pan. Bake 40­-50 minutes until topping is brown and apples are bubbly. Or just eat plain - it is awesome. Honestly, when I make this for my family, I leave out the honey in the apple filling. This means the entire pan only has 3 tbsp of added sweetener. It saves us money (honey is expensive! ), makes it perfect for breakfast, and when you add vanilla ice cream for dessert, the crisp is still delicious. However, most people I know prefer it with sweetener in the apples. If you are used to using more sweetener or are trying to wean yourself off of heavily-processed food, you might appreciate the natural sweetness of the honey here. Feel free to add up to 1/3 cup sugar to the topping as well - make it work for you! Coconut oil, palm shortening, and vegan butter substitutes all work great in this recipe! I have made this recipe with both oat flour and almond flour, and it's great! Remember to use gluten-free oats in order to avoid cross-contamination. Dinner for a Dollar is Here! I just popped this in the oven on a timer, so it’s ready for breakfast tomorrow. I’m always happy when I come across another family that sees fruit crisp as a breakfast food! I used a couple of nectarines that were getting on in age and rounded it out with some apples. I’m gluten free, so I used a combo of Namaste *from Costco) and sorghum. I couldn’t bring myself to use an entire cup of butter soI used one stick and then a blob of coconut oil. I bet it will still be tasty! My kiddo is quite dedicated to a different cobbler recipe, but it’s more work to make, so I am going with the idea that cobbler is better than no cobbler. I’m sure I won’t be disappointed! Thanks for sharing your recipe! Hope it turned out for you, Laura! I really like cobbler too. But crisp is easier and less gluten, so that’s what we make. It’s hard for me to use a whole cup of butter too, haha. But it really needs the liquid. I’ve tried cutting it down by a quarter, and that’s okay – definitely more like breakfast than dessert. You could also try substituting some of the fat with applesauce or pumpkin puree.